Costa Rica defender Bryan Oviedo will not face England at the World Cup after failing to recover from a broken leg. 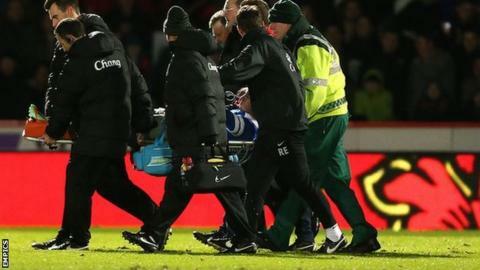 The Everton left-back, 24, broke his tibia and fibula during an FA Cup fourth-round victory at Stevenage in January. He was ruled out for the rest of the season but was expected to be fit in time for this summer's tournament in Brazil. England will face Costa Rica in the final Group D game on 24 June. After experiencing pain in physical tests, Costa Rica team doctor Alejandro Ramirezhas confirmed Oviedo will need more recovery time. "He was told to do some physical activity on a hard surface and showed some pains during the activity," he told Costa Rican newspaper Al Dia. "It means the player will be in no physical nor medical shape to play the World Cup." Oviedo had enjoyed a good season with Roberto Martinez's Everton side before his injury, scoring the winner against Manchester United as the Toffees won at Old Trafford for the first time in 21 years.